India’s hand-picked finest dancers are #ReadyToShuffle on the main stage. The India Finale Judges are all set to mesmerize us with their vibrance. 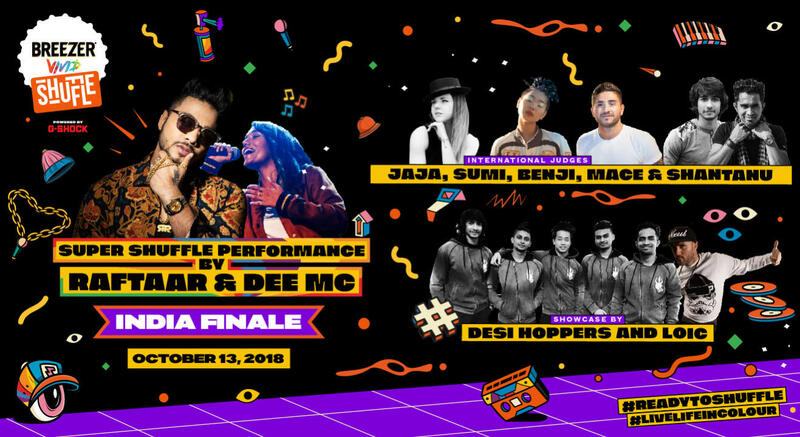 Get ready to witness the best of the Indian Hip Hop community set the standards with some insane dance battles and epic Super Shuffle Showcases at Breezer Vivid Shuffle India Finale 2018 this October 13th. Get busy with booking your FREE seats to experience the heat now and #livelifeincolour. P.S: The event will be held at a limited capacity venue. You will only get an entry on a ‘first come first serve’ basis. Raftaar, a powerhouse who has risen to fame in a short span of time and is today’s youth icon apart from being an endowed music producer, songwriter and singer Raftaar collaborated on Tamanche Pe Disco in 2013 and Whistle Baja in 2014 and Gabbar Is Back in 2015 which went onto becoming instant hits with the masses and they became a constant fixture on the airwaves. Consequently, he went on to win the highly prestigious Brit Asia Award from UK for ‘Best Urban Single’ in 2014 alongwith Manj Musik. A Malayali by origin, and raised in New Delhi, Dilin Nair, better known as Raftaar as the stage name, raps in Hindi, Punjabi, Haryanvi, and sometimes in Malayalam. Having given a number of hit songs like Tamanche Pe Disco from Bullet Raja, Pappi Song and Whistle Baja in Heropanti, Dal Makhani in Dr. Cabbie and Dhup Chik in Fugly, the cool and hip rapper has also performed at MTV Bollyland and Windsong Music Festival. Swag Mera Desi by Raftaar and Manj Musik which was released in 2014 and Desi Hip Hop which was released in 2015 were exclusively premiered by MTV for their Spoken Word Series which reached over a million hits overnight. Raftaar has become fashionably popular throughout the South Asian film industry having collaborated with music moguls like Vishal Shekhar,Manj Musik, Badshah, Muzical Doctorz, and many more from the music industry. Having fed his soul through MTV India's Coke Studio RAFTAAR has continuously paved his way as an artist with music producers from BOLLYWOOD to independent music and even having an international imprint. Making major contributions with his music for Films like - TIGER ZINDA HAI, DANGAL, LUCKNOW CENTRAL, TUM BIN 2 in 2017 he's had a massive opening in 2018 with his debut album ZERO2INFINITY being lanched back in MAY RAFTAAR only looks around for new opportunities where he can push boundaries with his new music. Bboy Benji started in 1995 and is the creator of Flexible Style. He is one of the most renowned Bboys in the world. Benji, also known as Benjamin Chaouat, began to break in Paris. That’s where he met Youval who pushed him to train intensely. Youval especially being a battle-cat, helped Benji train and forged his reputation by defying a large number of dancers. His style, combining flexibility, rhythm and speed, quickly asserts its reputation. He is contacted by the Californian company Rock Force Crew to join them in battles in the United States. In 2002, he participated in the film "Dance Challenge" directed by Blanca Li. This film was a real success. Oscar-nominated, he won the award for best choreography. Sumi Oshima is from Tokyo Japan, represents Warriors Crew/魁極龍 and has been dancing for 8 years. She was teaching popping and freestyle classes in Tokyo regularly as well as all over Japan. She has competed in battles regularly (most famous for being a finalist in Juste Debout, Japan) and has performed and judged battles there. She was also in the famous "Docomo" commercial and a backup dancer for Mihimaru GT and Billy's Boot Camp. Outside of Japan, she was a finalist in "Just For Laughs" in Montreal Canada, 2 time winner of "Battle Zone" in Vancouver, "Hip Step Zulu Poppin Battle" in Arizona, won the 2 on 2 all styles battle "Physical Poetry" with Crewmate Smoke in LA, and 2 on 2 popping battle "Extreme Popping" in SF with Crewmate Shockwave. At the end of 2014, she made the choice to move to Los Angeles to head further in her dance career. Her recent work includes the first YouTube Dance Movie "Dance Camp", and you can find her on the new TV show "Steady Mobbin" that will be shown on the new TV channel "The Dance Network". Loic is a renowned street dancer from France and represents Crew légendes urbaines. He is 3 Times winner of juste debout locking 2004 / 2007 / 2014 and 2 Times Finalist at KOD Locking. He’s the organiser of Next Urban Legend (France). Loic has conducted multiple workshops, been a part of famous shows & judged battles for Locking & popping around the world. Desi Hoppers is a hip-hop dance crew from Mumbai, India. Desi Hoppers were formed in 2015, with originally seven members. In their debut year, Desi Hoppers won the World of Dance Championships in Los Angeles. The crew created history by being the first Indian dance team representing the country in World of Dance (WOD) and later emerging as winners. The journey of their formation and a subsequent win was filmed as part of a finite television dance series called "Bindass Naach" on bindass channel. The crew was invited to give special performances on America's Got Talent (season 11) and Day Day Up. They are currently a part of NBC’s World of Dance in the upper-division with Jennifer Lopez, Ne-Yo and Derek Hough as the judges. Desi Hoppers were also invited as guest performers in the World of Dance finals 2017 at Los Angeles to showcase their performance. They are the only Indian crew to showcase an exhibition performance in World of Dance 2017. In August 2017, Desi Hoppers participated in the Asian Battleground - a cross-national dance competition held in Malaysia and ended at the third place. Since 2016, the crew has been conducting 'StreetMation' workshops across India, incorporating Indian cultural elements with street dance forms, majorly, Hip-Hop. Jana Vankova was born on March 21st, 1992, in the small town of Decin, located in the Czech Republic. Ever since she was a child, she has always had a big passion for dance. However, her professional career began in 2006, when she joined Out Of Bounds dance group. At that point, she began to explore street dance and choreography. Since then, she has been learning many styles (popping, locking, house dance, hip hop etc.). Later, she led her team, Out of Bounds, to become national champions of the Czech Republic in 2010, and semifinalists in Czech Got Talent (2010). Individually, Jaja won International Dancer Of The Year (2010), and a national championship in 2008. In 2010, Jaja was chosen to be apart of I.aM.mE Crew – MTV’s Americas Best Dance Crew Season 6 Champions – which led to her move to the US. She has received 1st place in several urban dance competitions and dance battles and has been featured in several movies. Additionally, she has choreographed for theatre shows, danced in various commercials, and could be seen dancing with artists like Selena Gomez, Ludacris, Kevin Hart and more. Jaja notably performed during the 1st Olympic European Games in Baku as a featured lead dancer. She is, perhaps, most well known from her appearance as the “Robot Girl” in “Step Up All In”, and as a finalist of So You Think You Can Dance (Season 12-Top 2). She has been trained by the Electric Boogaloos, Elite Force, and by all of the legendary hip-hop, popping, locking and krump dancers in the world. Currently, she travels the world individually. All the while, she teaches, performs, works in the industry and consistently improves upon her freestyle. Jaja credits America for many of her dance-related opportunities, which have allowed her to be creative as she continues to develop as an artist.